Everything about art excites. I feel so fortunate to paint anything that strikes my fancy or a client’s fancy. After 9/ll, when I took back my painting dream, my first commission called. 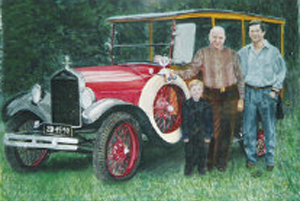 This commission was to paint three generations next to an antique car. My art teacher warned me emphatically, “If you can’t execute the spokes on the wheels, the painting will be a failure.” Luckily for me, Saratoga Springs, New York, has the Saratoga Auto Museum. Lying on floor sketching the three separate rows of spokes, I understood clearly the teacher’s warning. See the finished painting below. The mystery of life in all its forms intrigues me. Everything that keeps me alive comes from my passion to understand the mystery that is life. I feel blessed to have been the pupil of Morris Blackburn at the Philadelphia Art Museum back in my teens. Master painter Blackburn taught me that art is flowing instead of fussy, so I learned to paint with my body instead of three fingers strangling my brush. Decades later, New York Master Painter, Tom Vincent, moved me into acrylic painting and amazing color mixing and application. Always, I study the masters, read about their lives. Some of what I learn you can read about in some of my Garro Talk Newsletters, Just click the Button on the Site Directory and step into the Archives. Experimenting resulted in a new direction and art style: Abstract Synchronism, an instinctive, intuitive process. Not for every image, the Abstract Synchronism process begins with an idea that screams for it and will accept no substitute. The power of Abstract Synchronism motivates me to paint a single image to completion in total captivation. I literally respond to a vision that streams through my psyche, communicating with the spirit of the images in each painting. Colors then emerge in the painting out of this spiritual conversation. Time becomes relative. The process touches rapture. For an exhibit at the Sunnyview Hospital and Rehabilitation Center from June 2012-December 2012, I painted two sets of four watercolors with a color focus on red, green, blue and yellow.